WPB Exclusive – Snap Designs, Snap Layouts and Snap Themes! Whatever the reason, you need to make design, layout, seasonal or just color changes. Historically this takes you down the roads of cost, effort, time and money, none of which you have. You need it now! We got it for you. Your homepage needs a kick in the pants so you want to change the layout. It’s Halloween and you want some seasonal imagery. It’s Breast Cancer Awareness month and want to demonstrate awareness and make the site pink. Enter WPB Snap Designs – a new way of site construction. Put simply, the WPB Snap Design system is a drill down way to have layouts, color schemes and holiday themes at your fingertips for real time site changes. Gone are manual CSS changes (but they are there if you want them), row and column tinkering, image size adjustment and content module re-placement. The WPB Snap Design system starts at the top with three Snap Families. Each Snap Family is designed toward different set of content and business rules. For example Snap Family #001, might be for light to medium content producing customers whereas Snap Family #002 is focused on heavy content producers and Snap Family #003 is for cutting edge design brands. And there are more families in the deisgn phase. But the power comes when you are inside a Snap Family, because from there you can “Snap” to other layouts which keep your content intact AND also flip between color designs and themes with the tap of a button. Let’s focus on one Snap Family of the three and see the options. This is a music station called Melody and they are in Snap Family #001. You can see it has a navigation postion, a very dynamic video player, areas for Facebook and Twitter, banner displays, content stacks and on-air now; basically everything your site needs! Now let’s say you have a heavy Facebook promotion coming up and the site needs some adjustment, simply go into the WPB Snap Family control panel and toggle to another layout in the family…..
Boom! Your site strucutre has changed, the Facebook unit has moved up, the video module slid over, on-air as moved up as well and other content has moved down the page. All of your existing modules of content, navigation and revenue have retained their properties …but magically arranged themselves into the new layout. Never before has a system allow you to change column structures AND automatically fix your content into new locations on the layout. You’ll never lose content or an ad unit again during a redesign! Let’s try it again, in the WPB Snap Controls tap a new layout…. BAM! Another layout comes to life, again with all of your content intelligently shifted into smart locations in the new layout. 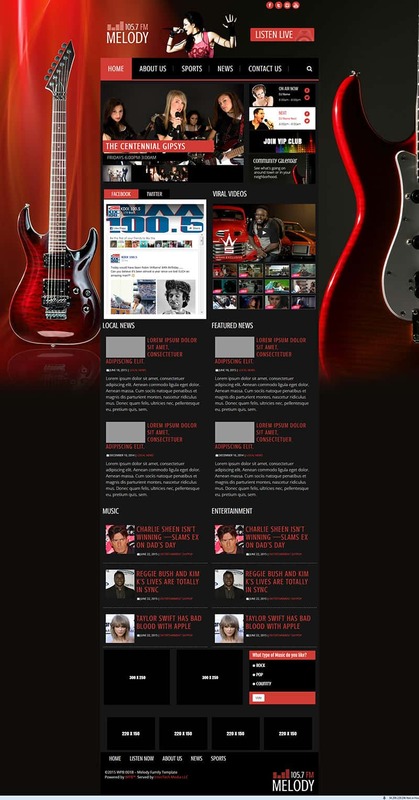 In this layout, the navigation is pinned to the top and slider now spans the top row of the site for an impactful first vistor impression – good for big promotions, concerts and contests – and the banner and on air modules slid down a row. What’s great is all the layouts in family are designed to work with each other’s image sizes, so there’s no additonal work required to change layouts. Really. No BS. It’s that time of year where sadly the days are getting shorter, you’ve been planning your promotional calendar for the fall dilligently. 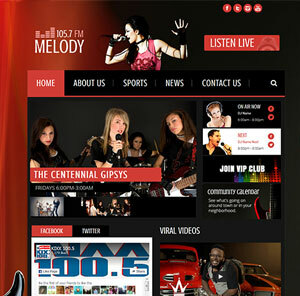 Our imaginary promotions friends at Melody Radio have been working on their remote schedule for fall festivals, their sales team has sold digital and terrestial packages for Back To School, Halloween, Thanksgiving, Holiday & NYE, etc… and the programmers have tweaked the on-air air content and branding so it’s just right. What about the site? The same scheme since July? No way, it’s a snap with Snap Themes. Snap Themes are prepackaged CSS and graphics bundles which can apply to ANY layout or family. They run from simple color changes to complete holiday and event themes. Right now: Three Snap Families each with at least three Snap Layouts each with at least 14 holiday, seasonal and color Snap Themes. A little math: that’s 42 Snap Looks inside of one Snap Family and 126 Snap Looks total. With no code, no waiting, no B.S. Oh Snap! Contact Al and Tom and get it for your site.